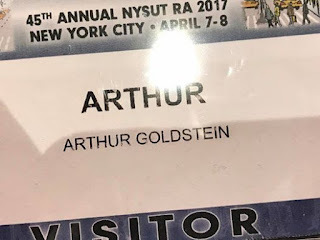 I'm at the NYSUT Representative Assembly. I was here three years ago as a candidate, running against Executive Vice-President Andrew Pallotta. I'm here this year as a guest of the Port Jefferson Station Teacher Association. I had cleared this with UFT, but there was no pass for me. While some woman was making a phone call to check out my standing, PJSTA's Brian St. Pierre walked up to me and handed me a pass. We are sitting up in a huge empty room watching the convention on TV, Norm Scott, Jia Lee, and myself. Evidently allowing us on the convention floor is too risky. We are hearing about who is teacher of the year. Interestingly enough, I'm an elected member of the UFT High School Executive Board. We high school teachers are kind of uppity. In fact once, in the eighties, we elected Michael Shulman of New Action our Vice President. This was unforgivable. UFT Unity disputed that election and prevented him from taking office. He spent a whole lot of his term waiting for the next election, which he also won. I was not particularly active back then, but I voted for him both times. We needed to be punished for that, so once they got rid of Shulman they changed the rules. Now all vice-presidents are voted for "at large." Since every branch but high schools votes Unity, this change affects only us. It's as though New York State were judged too liberal, and the Trump administration decided that Texas, Oklahoma and Wyoming needed to help us choose our governor. Thus, James Eterno got the majority of votes for high school VP, but he hasn't been seated. This notwithstanding, we all pay dues to NYSUT. While this happens, we are facing imminent "right to work" laws, which will make union dues optional. Meanwhile leadership is upstairs wondering why people won't want to pay. I say that as a strong supporter of union who will certainly pay. I met Lee Cutler here, who was unceremoniously ousted three years ago. Lee was much loved by NYSUT members, and almost managed to edge out Martin Messner, the choice of UFT Unity. Richard Iannuzzi told me that UFT holds 28% of NYSUT membership, but 33% of the vote. Thus, with the Unity loyalty oath, they only need to grab 17% of the vote to do whatever the hell they wish. And this year, they're dumping their hand-picked President Karen Magee, giving her a golden parachute to AFT somewhere, and planting UFT's Andrew Pallotta as President. Yesterday there was a vote to introduce democracy to NYSUT, by allowing remote voting. Many small locals just can't afford a weekend at the NY Hilton. It was defeated. Mike Lillis, running for President against Pallotta, told me that 50% of locals weren't here. On the other hand, the Unity people say 88% of delegates are registered (though not necessarily present). I'm not sure exactly how that jibes, but some locals are very small indeed, so they could both be true. During this campaign, NYS Unity has not bothered to debate Stronger Together. Who needs to see the candidates head to head when you begin with 33% of the vote in your hip pocket? I was approached by a delegate who remarked, "In my union all the good guys get to be delegates. Not like yours." Don't get me wrong, there are some great people in UFT Unity. But that doesn't mean we're represented. 20,000 high school teachers aren't represented at all, and if that isn't an outrage, I don't know what is. Update: No surprises here as NY State Unity candidate Andrew Pallotta becomes President of NYSUT.